Carlos Vela looks likely to miss Arsenal’s pre season training and maybe the beginning of the Premier League season after suffering a relapse to his injured ankle he suffered two weeks ago while on duty for Mexico. As we reported last month, international duty for Mexico in the Gold Cup and then for the subsequent World Cup qualifiers meant that Carlos would have missed a large part of pre season training anyway. Now he looks like being out for longer. When Carlos suffered the original injury to his ankle it was initially feared that he may have suffered a break. Further tests however revealed it was a sprain, though there was still the worry that there had been some serious damage done to the player's ligaments. "The injury that is present is medial tibial pain, affecting the ligaments on the leg. In simplest terms, he has a sprain," Radames Gaxiola the Mexican team doctor said. Well it looks that that diagnosis was wrong as Carlos has had to withdraw from training this morning unable to put weight on his leg. The rest of the team trained this morning in Dallas Stadium without him. The Mexican national side arrived in Texas to prepare for the Quarterfinal game against Haiti and it looks like they will have to make do without the young player. The injury curse starts again. 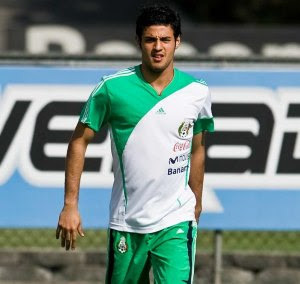 According to Mexico spokesperson Mauricio Zavala, Carlos Vela will be available ot face Haiti on Sunday. Breaking new's I heard a rumor that Mexican Carlos Vela is on the verge of signing with English club Arsenal F.C..Hopefully this is true and remember where you heard it first right here the home of exclusives!!! let's face it, the squad has got too many little weak players....how many Man U or Liverpool players were injured this year? Who have had problems with: Vela, Rosicky, Fabregas, Walcott, Vela, Eduardo all of whom are 5'9" or less and weigh less than 11 stone. They are all great players, but we just have too many little guys who end up playing for about 50% of the season. As a group, they end up being bad value and you can not build a stable squad around a team which usually had 3 or 4 of it's key players out.